I made these cupcakes on Mother's Day for the family gathering. The feedback was positive. I like making cakes that are not fussy about how it is mixed and yet turns out with a nice texture. Best of all, cakes that can be mixed with a hand mixer from start to finish and this is one such cake. Easy peasy. And it is a beauty. The cupcakes were light, fluffy, rich looking and so yummy. For now.....I can stop trying out chocolate cake recipes. I have found the ONE ! I have named this Trademe Chocolate Cake to differentiate it from the thousands of recipes out there for chocolate cake. 1. Sift flour, salt, baking powder and cocoa in bowl. Dissolve baking soda in milk. 2. Cream butter and sugar until light. Add essence and eggs and continue beating. 3. Add in the rest of the ingredients and beat with hand beater till smooth. 4. Divide and spoon into greased paper cases (only half fill the cases as the cake rise quite high). 5. Bake in a preheated oven at 160C for 15-17 minutes or until a skewer inserted into the center of the cake comes out clean. 6. Leave to cool on rack before icing. Ice with whatever type of icing you prefer or dust lightly with icing sugar. Add hot water by the teaspoon to the icing, cocoa and butter. Mix thoroughly and continue to add water (slowly) until the desired consistency is achieved. This small lot of icing will not be enough to ice 23 cupcakes. Make more as you go along. I prefer to make small lots as the icing can go hard quite quickly. If making a big cake, double the recipe and bake for 45-60 minutes at 160C. Big cake measurements according to source is 34cm x 23cm x 4cm high. tried it last night and it was a hit. My daughter wants it as her birthday cake....so making a whole lot and I am going to decorate it with a lettering for each cupcake. So happy the cupcake is a hit for you too. Happy Birthday to your daughter. i've tried baking this cupcake today..and it's so soft and yummy..like the texture a lot. 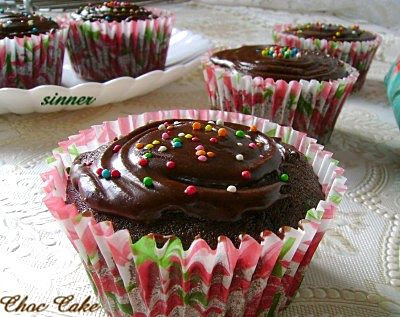 thanks for sharing such a wonderful recipe..
Great cupcakes. Will give it a try soon. Thanks for sharing the recipe. Hi Olivia, would love to get your feedback after you make these cupcakes. I've made this thrice as of now and it gets better each time, nothing but compliments. Thank you! You are most welcome. Your cupcake looks perfect. thank you for sharing all these wonderful recipes on your blog. i came into your website while searching for yu sheng however i got carried away by all the other dishes. i'm a singapore but live in yukon in the city call whitehorse. not many people know this place in canada but usually mistake it in alaska as we are just next to each other. i must say of so many food blogs i've visited, yours is one of the best i've seen. your videos are great help to me. as i'm far away from home, i do miss many of the local food. now i'm determined to try out many of the local dishes you shared on blog. btw, do you have a good recipe for birthday cake? i love to bake one for my son on his 3rd birthday. hope you have a blessed CNY. Thank you so much for the compliment - gives the ego a boost haha. You are at the right post for a birthday cake. 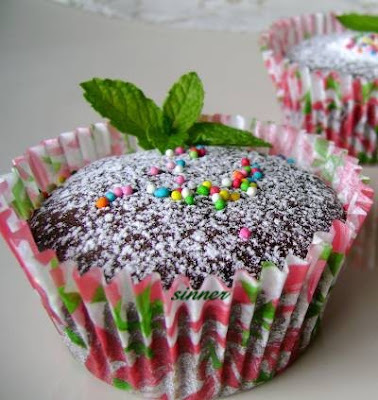 This choc cupcake is soft, light and moist and best of all, it is not fussy about how you fold the flour in. Trust me - you can't go wrong with this cake. Why not give it a trial run first before the big day. Happen to chance upon this website while searching for choco cuppies. Tried this recipe and it's perfect! Is gonna be the One and Only ! I used brown sugar, top flour, and substituted with canola oil. I had a flat top muffin...hahaha instead of rounded looking ones like urs. Taste wise, soft and fluffy, sweetness just right! My hubby likes it.